Would you like to learn to love me best of all? Two women talking, in the hallway, outside the dance hall of a tango studio. Hola – Long time, no see. You haven’t been here in awhile. I think so. It’s been a few months. It’s going well. Is he interested in trying? He says he might try it. I understand. I really hope it works out. Me too. He’s really special but I can’t give up tango. Well, of course not. Who could? Who does? Of course, the men you are dating are cool on the subject of tango. They twitch and fidget the minute you mention you do tango. You ‘do’ tango - heavens – even saying it like that makes me curdle inside. How inadequate. But that is how you say it to the civilian world. No one ‘does’ tango of course; it is not like ceramics or Pilates. It is - it becomes - your life. It is soul reaching and altering and yet somewhat ill advisedly but understandably, it is the first thing you share when you dating. ”I do tango’ . Yes, I’m sure. Quite. Well, of course the man you are dating is likely to be more than disinterested unless he was considering tango himself anyway – which means he has Tango Soul Potential, and at the very least, that self-discovery thing going for him. But more often than not they will say, ‘I have two left feet’ or is that like Arthur Murray or in the movies? Or I hate dancing or isn’t that for sissies or phony Latin lovers? They mimic a dramatic, exaggerated tango dip and chuckle. You try to chuckle back casually but your heart goes crestfallen as hearts can do. Mostly, they seemed bored and tune out for a minute when you mention it. You could have mentioned your once-weekly yoga or Tupperware session with the girls for all the response you get. Well honestly, what man wants to hear that a new woman he is dating is not-so-terribly physically exclusive? Moreover, not exclusive because, in fact, she is dancing some of her nights away, and away from him specifically and in the arms of not one, but possibly – and more significantly, many strange men! I mean, there it is. What can be clearer? I am sure more than one has thought ‘Why does she need tango? She has me now”. Right off the bat they are competing against the ultimate rival lover: the unknown, sometimes yet undanced-with, tango dancer. The ultimate, other man. Tango is not like any other pursuit and you can pretend until the cows come home and dance tango themselves that it is ‘only dancing’ and not romance but it is a human collision and the possibility of something happening or at least, your soul waking up is always there. Seasoned tango dancers are a bit more immune than that of course, otherwise you would fall in love with someone new, with each new dance. The unspoken fact is, you are in the embrace of someone else, laminated against them, bound by the contract of the melody and rhythm of the music, and for those 3 minutes at least, you are at once being faithful to tango but unfaithful to someone else (lover or previous tango partner). Let's be frank - tango is not chess or fly fishing; it is ignitable, unspoken, undeclared essential things which is why it is so addictive. To give up tango in service to having a relationship outside it is like hacking off your soul to make it fit shoes that almost fit. So, if your new romance is not in tango and does not want to learn, you learn, instead, to compartmentalize, or hone that ability. Not so hard to do when you go from partner to partner in the course of a milonga anyway. You know, if a man I cared for was into tango and I was not - frankly, I would be unnerved too. But I would quickly learn to tango – maybe not even tell him. Find a class and learn on the sly. Surprise him and perhaps keep him near and move things into the next level of what-we-can-explore-and-do-together’. Otherwise I too, would imagine he’d be falling in love every other dance and come to me, wafting stale l’Air de Temps. Chanel #19 or worse – that simple, natural scent of another. One woman I once spoke with - a tall blond Russian math student confessed, “I sneak out to tango. I tell my boyfriend I am having a drink with my girlfriends. He does not dance; he cannot see why I must and so I lie. I left him home hours ago, fast asleep on the couch, watching some reality show. Before I return, I will change my shoes and spash water on my face and neck (to wash off the scent of the aftershave of the other men). This way, he doesn’t ask - he notices nothing. I hate lying but I cannot give up tango’. But you tell a man you dance tango so he has an idea of what is important to you and how that delicate nuance of music, rhythm, mood, and partner so captures you. You make the mistake of thinking you do not appear clingy or without a life and interests and a worth in other venues, however platonic. You want him to know about you and tango and that is your passion so he will know you. But it has the opposite effect. Many men greet the news so frostily, it is almost as if you haven’t said anything, that inside, a part of you shrivels and you wonder – if you do fall in love with this ‘him’ – this real ‘him’ -the rival of all the tango partners past, present and future, if you will have to give not only them up, but tango itself– which, not unlike the marriage deal – is like giving up your own country and living forever as an ex-patriot in a land that does not even recognize the Republic of Tango. Well, what do you want them to say? That they love the idea of you dancing with other men? All the time all they are thinking is how do you even do that without touching the other man – without your breasts grazing some other man’s chest? Depending on the woman (such as me, for example) the clearance factor might be rather nil and you are grazing no matter how you stand, close embrace or not. Yes, I am sure most men who don’t dance tango listen to you confess you do and smile benignly but all the time they are thinking of how difficult it might be to keep your interest – She does tango. She might leave. Hard to hold. Hell, who needs this? When so much about maleness is about power, the idea that here is a woman already roaming in a whole other garden of male prowess, it is entirely possible that a non-tango man, might feel threatened which he cannot admit so he might just as well let go. A sman with spine who is into you will fight the good fight but this might be a battle beyond. On the other hand, if he leaves, little does he know, umpteen pairs of male arms are there to catch you anyway. A simple truth: A man that can lead; a man that can dance – he is more likely to keep his woman - if only as a tango partner. That woman knows she is taken care of. She is not controlled, dominated or even led. She is guided by male confidence and a man who receives her in an elemental way that has been the way it has been ever since we all left Eden. Why doesn’t everyone get this? If people only read Genesis and came to tango, the self-help book section would never exist. Women wouldn’t even give “He’s Just Not Into You’ the time of day since somewhere, there is a man who leads her like a swam onto the dance floor and opens her like a fan in three bars of music. How’s your pulse? Still ticking? A man that knows how to dance, he has something over all the other men. He is macho in a way that is primal and as old as time. He likes being a man, he has music in his soul and his limbs and his heart. This beats anything Hallmark and Victoria’s Secret could ever dream up. The funny thing is, a man that is unattractive to me will get my attention as a man, if he leads me well as a dancer. I reaccess. But a man who has my attention already, if he cannot leave, something in me, alas, wilts. Much like sharing a sense of humour or enjoying the same foods, there is a intimacy there that is a precursor of other things. I don't suppose it is a deal breaker but it is a truth I have not yet been able to ignore. The bigger truth is the latter one however wherein a man that is unexceptional becomes notable - for the connection he can offer me on the dance floor. Tango with benefits, someone once called it. You think they call romance ‘the dance’ for nothing? Really. Think about it. I mean, where do you think they got that? One step forward. One step back. Resolution in that embrace, denunciation, articulation, chase, pause, capture……repeat. 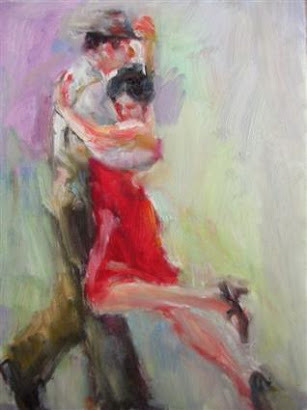 The dance, (what do they say about it “Tango is a horizontal wish expressed vertically?) done well, puts foreplay to shame. Everyone does it differently. You see it on the dance floor –unfolding, never ending, mini seductions. It lives from bar to bar, twisted, syncopated, quarter note-to-quarter note: it is achingly endless. It is the most pure of legal, mood altering narcotics I know. Off the dance floor, the dance is called, and is, the Game. The Game is what you do when you are not sure of where you want to be and whom you want to be with. The game lets you buy time. The dance is what you do when you are pretty sure you want to be there but you are pretending – eking it out as it were – so that you can savor every beat, every touch, every motion that is a motion away. Which brings me to the ultimate, unvoiced dream: how would it be to dance tango with a man you did want, could love, could be with? Now – this is ridiculous because up until recently, I have never been remotely attracted to anyone I have met at tango. It is the code. Like French prostitutes who don’t kiss, you don’t fall in love with each tango partner you have. It’s not done and not cool and if it does happen, it is rare and special if and only then. I always say ‘you don’t meet anyone at tango’ because for years I have seen the same men and women line the tango floor, sipping their solitary glass of wine or Perriers (tango people are hardly big drinkers), and dancing with who they know or occasionally a new person but I do not see much romance happening. Chances are, it happens outside tango –you take on new person in your life; it may last and you necessarily drop out of tango for two reasons. If tango was not about your soul then anyone who holds you is distraction enough. Or, they simply do not care for you going off on a Friday or Saturday night while you do tango or care to watch you dance with other men so you stop tango in order to not lose what you think (hope or dread) might replace tango. The good part about romances that do not work out is that there is still, and always tango, and someone to catch you. But if you lose tango? Well, that outside thing better figure in the soul mate column – because that is some sacrifice. So, how would it be to find someone at tango? How would it be to be held by a man you were attracted to – mind, body, spirit – to dance with him? How would it be to dance with someone you could see caring for, making love to, and even being with outside in the real world, beyond tango? See? The reverse scenario? Could a tango union retain it’s magic outside of tango? 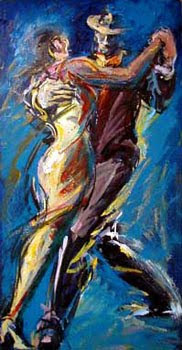 If there is only the dance – but somehow you soul, spirit and mind is not reached – could tango ever be enough? Well, if I find out, and I intend to someday, I will tell you. Actually, someday soon….I would think, or so it seems to be, for tango, always a blood sport….is certainly heating up. I will keep you posted from the front lines.